Every tooth in your mouth is vital for maintaining your oral functions and health. When even one is missing, your quality of life and confidence suffer. To stop the new challenges you face, you do have options. A bridge and dental crowns are one of the most convenient and affordable treatments. A prosthetic tooth is designed to look like your remaining natural teeth to fill the space. Dental crowns are placed on your adjacent teeth to hold it in place. You can enjoy an option that looks and feels natural with dental implants in Oklahoma City. A biocompatible implant post is surgically inserted into your jawbone to replace the root. An abutment is connected to the post to attach a custom-made crown. When several teeth are missing in a row, it can lead to chewing and speaking difficulties. In addition to a traditional bridge and crowns, you have other options. Instead of using dental crowns to hold the bridge in place, an average of 1 or 2 implant posts anchor it to your jawbone. To fill the space of several missing teeth, prosthetics are featured in a gum-colored base that is attached to a metal framework. This allows it to clasp onto our adjacent teeth. 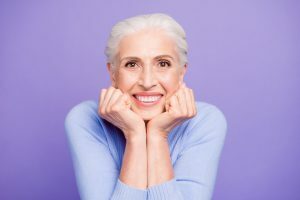 If you have lost all your teeth on the top or bottom arch, your cosmetic dentist in Oklahoma City has two options to treat complete tooth loss. Prosthetic teeth are held in a gum-colored base that has been made from impressions of your mouth. Suction or an adhesive will hold it in place. To gain added security, an average of 4 implant posts can anchor your denture to your jawbone. You will enjoy an increased biting force of over 70% when compared to the traditional option. Your dentist will help to determine which treatment best meets your needs to reinstate a complete smile. Dr. Joe Isaacson is an award-winning dentist in the community for comprehensive dental care. He creates personalized treatment plans to help each patient achieve their best smile. If you have missing teeth, he can help. Contact our office today to schedule your consultation.